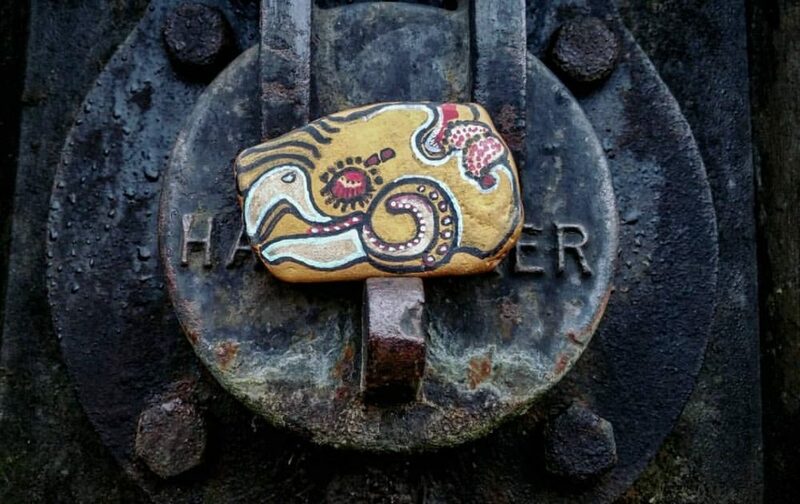 From a time-traveler’s treasures – “Quetzal Stone” – painted in acrylic and ink. An ancient mystery on your palm. A hand drawn Mayan symbol, black, blue and magenta ink on dull gold painted Welsh pebble. Little unique gift for anyone who loves symbolism and mysteries of the past. About 7 x 4.5 x 0.5 cm; 2.5 x 2 inches. Completely one of the kind and non-replicable. Acrylics, inks, varnish. Suitable for outdoors/garden but will last longer indoors. Tagged ancientarts, artcollection, artfinder, artforthehome, artwork, balance, craftsposure, creativelife, FantasyArt, fantasycraft, fantasydecor, giftideas, greatgifts, homeinspiration, instaart, interiordetails, linandaras_art, livecreatively, mayan, myparagonquest, pebbleart, quetzal, smallartworks, symbol, фантазия.